The HWS Marketplace (Elemental Trading & Black Market) concept was orginally developed by HWS and was adopted by Eleon into the official version of Empyrion. 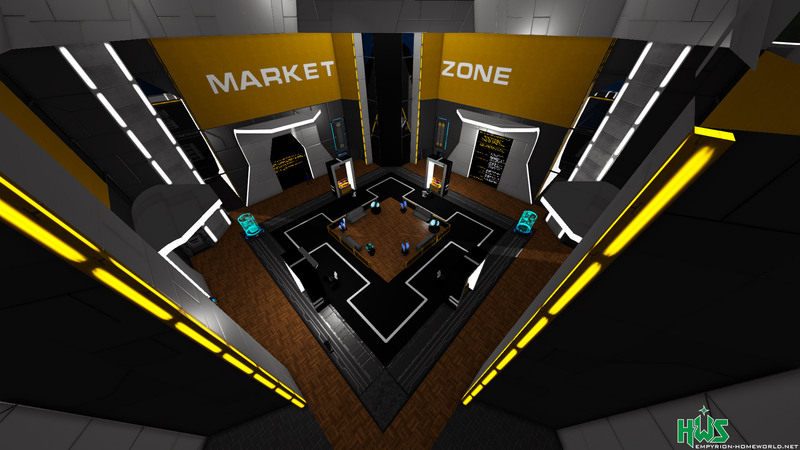 Pictured below is the Elemental Galactic Services HQ Market Zone. Visit https://cmd.hws.global or check your PDA > Guide > HWS Commands or type ti:? for all available commands. How does HWS Marketplace work? There are special commands to sell and buy items or use the proper buttons in HWS Connect. If you wish to post items to the EGS Market for free, you will need to travel to an authorized trade zone. Your transaction will be taxed at the rate of 10% credits and 1 RP per item, if you are not in the trading zone. Where can I use the HWS Marketplace? These automated discounts ensure that an item for sale increases its bargain value over time. Be sure to get all your items from the EGS Market & Blackmarket before a full wipe. If you fly the ship you have available for sale, it remains tracked by the HWS Connect Structure Commander and is therefore still taxed when left on ECC. Once it is tagged for sale, do not fly it on or off of ECC afterwards. Trader RP mentions blackmarket, but where are the black markets?